Voiles are so versatile you can easily remove them for laundering, or you can jazz up your windows just by using a swathe of fabric cleverly draped over the pole you really don't need to be artistic, or layer the window with light weight open-weave fabric and new curtains to protect the room from the sunlight and in summer it will remain nice and cool. The beauty of voiles is that they can be incorporated into many different designs and hung either from a track or pole and a wire or net rod. Whether you're looking to purchase traditional curtains or blinds, we will most definitely have the right style for you. Curtains, nets, blinds, sheer and very light weight voiles are the main pinnacles of our business and we only offer 1st-class professional services that are courteous and friendly. We at nets2Go.co.uk not only specialise in producing stylish and unique designs, but also quality products at unbeatable prices. If you're looking for something different then look no further. Be it the stunning natural looking fabric of our voiles with the latest 'eyelet' heading styles of fine soft sheer fabric, or for a distinctive look from our wide range of fabrics, then these are most definitely for you. Our product range of high standards has earned Nets2Go an immense reputation for reliability and excellence. We know how to dress windows to perfection so, if it's inspiration you're after, then why not allow our expertise h elp you achieve a plush and luxurious look at half the cost that, at the end of the day will simply add the perfect look to your home. 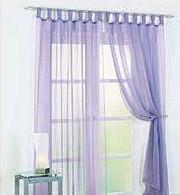 The practicality of machine washable voiles that add a delicate, flowing touch to your windows, are transparent woven fabric mainly used for curtains and usually made with cylindrical combed yarns and gathers extremely well. For elegance and beauty to all your window dressings, including accessories, call us or buy online today the secure, safe and easy way. Selecting the material is both fun and rewarding and important for choosing what fabric and colour combination are right for you, so if style and statement are more important to you, then going for beautiful embroidered curtains with a delicate and bright look to give a coordinated feel, will also control light levels and give you added privacy. Going for that wonderful natural linen look at great value for money coupled with a heavier curtain will look impressive on any window. 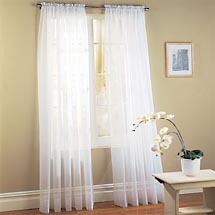 For a unique stunning appearance check out our marvelous collection of voiles.